Can I change a training event's host? If your event is live, you will be prompted to approve the change and presented with a list of potential candidates. Note that once an event is live, you can only choose organization members who have already logged-in to the event. Both the current and the new hosts will be notified in their classroom environments of the change, and the new host will have to approve that they're accepting responsibility. Changing the host for an event which hasn't yet started is straight-forward and requires no confirmations. Anyone in the organization can do that by editing the event in the management panel, This allows to take control over an event in case an event's host is experiencing difficulties logging in or otherwise. 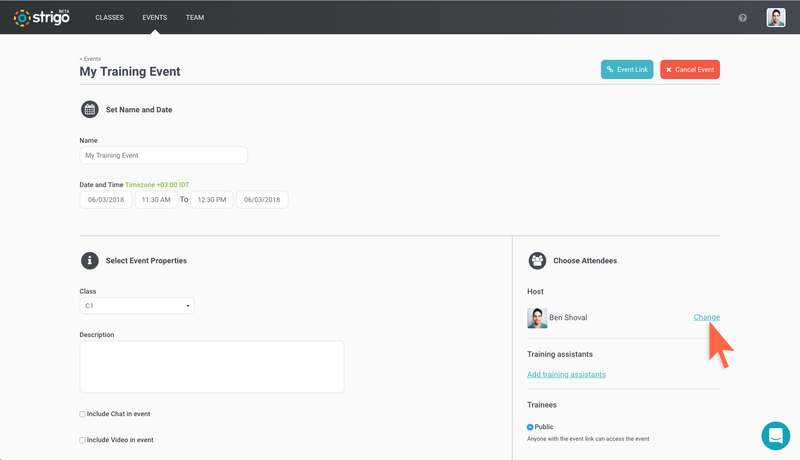 Note: If you wish to select someone who is currently configured as a training assistant to be the host, you must first remove him from the training assistants list.